Statement making t-shirts drew attention to the current political environment. 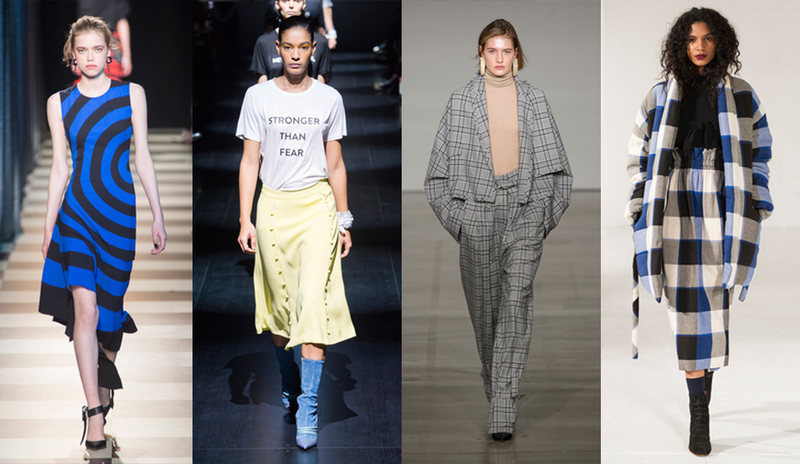 That said, once made, fashion resumed the business of fashion with fresh interpretations of classic fabric patterns such as Prince of Wales checks, Highland plaids and oversized lumberjack plaids. They were re-coloured and often interpreted into non-traditional evening and long daytime dresses besides the ubiquitous classic suits and jackets. Graphic patterns played with op art circles and lines as well as precisely placed repeat designs. Random abstract art prints added a colourful element. Winter florals in elaborate jacquards set a dressy note. Simultaneously, floral prints also made a fresh sportive statement as a quilted jacket with matching skirt.